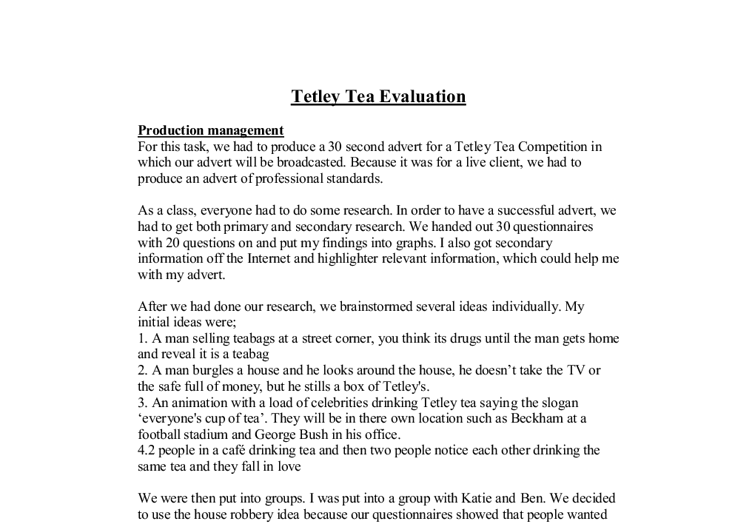 Tetley Tea Evaluation Production management For this task, we had to produce a 30 second advert for a Tetley Tea Competition in which our advert will be broadcasted. Because it was for a live client, we had to produce an advert of professional standards. As a class, everyone had to do some research. In order to have a successful advert, we had to get both primary and secondary research. We handed out 30 questionnaires with 20 questions on and put my findings into graphs. I also got secondary information off the Internet and highlighter relevant information, which could help me with my advert. After we had done our research, we brainstormed several ideas individually. My initial ideas were; 1. A man selling teabags at a street corner, you think its drugs until the man gets home and reveal it is a teabag 2. A man burgles a house and he looks around the house, he doesn't take the TV or the safe full of money, but he stills a box of Tetley's. 3. An animation with a load of celebrities drinking Tetley tea saying the slogan 'everyone's cup of tea'. They will be in there own location such as Beckham at a football stadium and George Bush in his office. 4.2 people in a caf� drinking tea and then two people notice each other drinking the same tea and they fall in love We were then put into groups. I was put into a group with Katie and Ben. ...read more. Production Techniques We rented out all f the equipment and Katie took it back to her house ready for filming the next day. On the day of filming, Ben was the Director and Actor who played the Robber, I was the camera operator and Katie was the Continuity manager and the Actress who played the homeowner. It took us about an hour and a half to film. There were a few problems such as we did not have any Tetley tea so we had to go to the shop and get some. Also there was bad lighting in some scenes but we overcome it by using a torch. We used a wide range of different shots so our audience don't get bored. We used low angle shots, not to show subject vulnerability but to have a CCTV effect. We also had high angle shots to show subject power to the burglar. We also had a point of view shot to make the audience feel like they're the burglar, so it makes them feel like they would do anything for Tetley Tea. In some of the shots, I used manual focus; this was to focus on a specific object, such as the final shot were I focus on the Tetley tea bag rather than the burglar in the background. Because we had to work to a professional standard, we had to make sure we had the white balance correct before we filmed. ...read more. The class also said the fact that we didn't start the music off straight away or before you saw the visual but a few seconds afterwards was better than if we had done as it gave the audience time to think about what was going to happen before the music helped to make assumptions. Was the length appropriate? The class agreed that it was just the right length for an advert but it could be just slightly too long for some people that have a short attention span and that are not to interested in Tetley tea. But over all the total time was 53 minutes long and the class agreed it was the right length. Can you tell who are target audience is? The group said that they could tell that it was aimed at a younger audience due to the style that it was shot the music it contained that the type of house that was used for filming they said that it was quite clear but that an older audience might not find it as appealing as we'd like it to come across as. Did we meet our target audience's wants and needs? The class thought that we advertised Tetley tea as much as possible without over advertising it. The fact that we waited a while before we put in the shot of Tetley tea was better than having bought it in immediately. 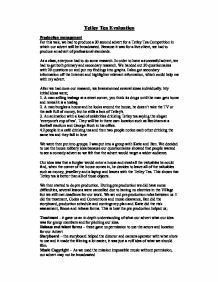 In their opinion the audience wanted Tetley tea without it being shoved in there face because in some cases that makes people not want to buy a product. ...read more. any phones that do not live up to what it is supposed to live up to. Advertising standards authority For my business I will have a total budget over a year for advertising and promotion. That budget will need to cover different types of advertising over the year this will be split into different segments. market, it may need to reduce production for that market and increase the production of family oriented shows. * Pricing: The advertising pricing model is competitive with local market rates. This model will position us to be profitable at the end of year one. is the widespread query of the common man. Not every person knows exactly what marketing is. To find out for myself what 'marketing' really is, I decided to look up a number of wide-ranging references. Though different sources provide a varied outlook of what 'marketing' really is, all the diverse informants culminate to form the core definition of 'marketing'. The Tea market in general is 'high interest' - accordingly, only brands with relevant emotional values will be able to form bonds with consumers. On a global basis Britons belong to the top in the tea league - after Turkey and just ahead of Ireland and Hong Kong. This decline in attendance can be attributed not only to the AJCs' outdated brand image and overall poor awareness, but also to the exuberant amount of competition the organisation faces from the three separate industries it is susceptible to: entertainment, sports and gambling.